It’s round two Friday night of the Plum Peachy stake and after the first ICF 3-year-old pace series the only certainty is that their will be some owners getting a restful night’s sleep while others could be doing a lot of tossing and turning. The Plum Peachy opening legs produced not one but a pair of shockers in the two $12,000 divisions raced. First the Kim Hamilton Stable’s Fancy Creek Jolene (Matt Avenatti) popped at odds of 45-1 and then a few races later Filly Forty (Jamaica Patton) lit up the tote board at odds of 58-1. Earlier this month I wrote here about Filly Forty so this time around I’ll focus on Fancy Creek Jolene, the Frank Marcolini owned filly who began her career in what can only be described as in dreadful fashion. In five starts as a freshman, all in ICF freshman stakes, Fancy Creek Jolene made a scanty $825 as a 2-year-old and that amount came in just one check, a fifth place in round one of the Incredible Tillie and it was a far-back fifth place finish at that. Fancy Creek Jolene went off stride in that first leg and she also went off-stride in the second leg. She did manage to stay flat in the third round but finished ninth and was distanced, beaten some 25 lengths. In her final Tillie Leg she starting running again instead of pacing and earned zip. In her final 2-year-old start, the “Tillie” Stake Consolation, she, you guessed it, went off stride. And “Jolene’s” sophomore season didn’t begin any better. In her mid-April season debut at Hoosier Park the filly couldn’t stay on stride and finished up the track again. However she did have a strong qualifier on the Indiana track a couple of weeks later, winning in 1:55.2 with a 27.3 last quarter. So things were looking up for the Sportsmaster filly but alas, not for long. 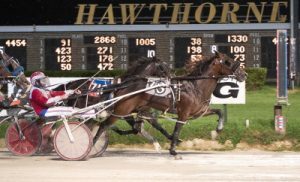 Jolene was nominated for Hawthorne’s Dave Magee Late Closer series but went off stride in her first leg on opening night (May 11). A week later in her second Magee outing, it was more of the same, so after three starts as a sophomore she had earnings of zero dollars. As they say “that was then and this is now” and now she has $14,600 on her card by turning things around in a big way. The turnabout actually began in her start before the first $12,000 Plum Peachy with Matt Avenatti at her lines for the first time. “Jolene” was ninth, ahead of only a breaking horse at the three-quarter pole and still ended up second best at 91-1 odds. In the Plum Peachy she had the 10-hole and was 10th at the first quarter, a dozen lengths behind. She was ninth at the half, eighth at the top of the lane and then unleashed a 26.2 last quarter to pop with a 1:55.1 mile. Since then “Jolene” added another victory, this one in an ICF non-winners of two event, and was a close second, dropping a head decision, in another NW 2 against some open company fillies. As it turns out Fancy Creek Jolene’s size was the primary reason for the unfortunate start to her racing career and her owner’s patience with his filly is now starting to pay dividends. “She has really matured but even at the beginning of her 3-year-old year season she still had a lot of learning to do. Hopefully she has it figured out and can keep it going forward,” said the Iowa native. With 24 entries for Friday’s Plum Peachy the second leg of the series was split into a trio of $12,000 divisions with Fancy Creek Jolene (pp 2, Matt Avenatti) set to meet the other first round stake series winner Filly Forty (pp 1, Jamaica Patton) for the first time. The latter was a recent purchase by A Piece Of The Action (Culver City, California) and now races out of the barn of conditioner Donna Holt. Lady’s Party (pp 1, Casey Leonard) fresh off a romping 3 1/2 length victory a week ago in her first start for trainer Terry Leonard is expected to be the first division (second race) heavy favorite. Lady’s Party will start inside of last season’s ICF division champion Princess Sage (Freddie Patton Jr.), Windian (Tim Curtin), Dandy’s Dududidudu (Kyle Husted), My Uptowne Girl (Brian Carpenter), C Far (Gary Rath) and Rousey Ronda (Ridge Warren). The wide-open third race second division will be comprised of (from the rail out): San Antonio Rose (Ridge Warren), Miss Tennessee (Kyle Husted), Fox Valley Dandy (Tim Curtin), Hope Hotspur (Juan Franco), Ashlees Cocktail (Mike Oosting), My Mona Me (Matt Avenatti) and My Kind Of Dance (Casey Leonard). Thursday Notes: Jim Lackey drove three winners last night while Casey Leonard and Tim Curtin each had a driving double. The seventh race winner Star Of The Party, driven by trainer Kelcey Perymond, was a Mike Paradise Price Shot selection at $25.00. 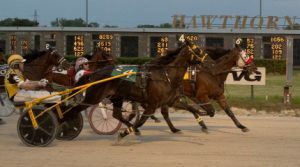 While most of the Chicago area fireworks shows won’t be seen and heard until the Fourth of July their will be plenty of noise being made on Hawthorne’s race track by ICF youngsters competing in the two prior evenings. Coming up this weekend are a couple of very important nights of racing for the owners and trainers of both 2 and 3-year-old state breds, starting with Saturday’s elimination events for the freshmen Cardinal for pacing colts and geldings and the Violet for pacing fillies. 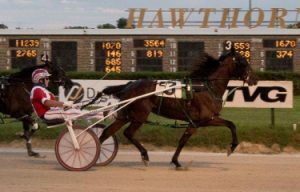 The Cardinal and Violet 2-year-old trot eliminations will be contested on this Sunday’s July 3rd card, along with the second legs of the ICF 3-year-olds Beulah Dygert (females) and the Erwin S. Dygert (males) stake series. The Tom Simmons Stable’s Beach Shootingstar (inside, Mike Oosting) returns Saturday for the Cardinal 2-year-old stake eliminations. (Four Footed Photo). 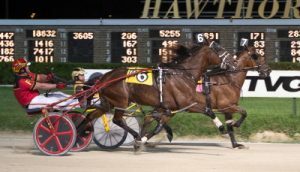 Sharing the Saturday, July 1st spotlight with the Cardinal and Violet pace elims, is the second leg of the Robert F. Carey stake series for Illinois conceived and foaled sophomore male pacers. The Plum Peachy second round for 3-year-old pacing fillies will head-up Friday’s card. All the ICF stake series finals will be held on Hawthorne’s Night of Champions. (Sept. 23rd) They will be comprised of the 10 highest point earnings through four series rounds. A high finish could be essential to those 3-year-olds who didn’t fare well in the first leg action or missed that leg. Stake Series points are counted as: 50 for a win, 25 for second, 12 for third, 8 for fourth, 5 for fifth and 1 for starting. First round winners Fancy Creek Jolene, trained by Kim Hamilton and Filly Forty now racing for trainer Donna Holt, are sitting pretty on top of the early Plum Peachy standings. Runner-ups, Boogie On Down and Rousey Ronda are in a favorable situation with 25 points each while Dandy’s Dududidudu and Lady’s Party are in the thick of it with 12 points each. Currently sharing the top spot in the Incredible Finale series with 50 points, are the second season male pacers Royale Big Guy, owned by the Megan Rogers Stable of Chicago, and Fox Valley Nemitz from the barn of Nick Giberson. Then comes Captain Rhett and In Your Eye with 25 points each, followed by Gabe Henry and Fox Valley Herbie, both with a dozen points. Royale Big Guy (No. 8) will be back from Pennsylvania for Saturday’s Robert F. Carey ICF Stake Series. (Four Footed Photo). Royale Big Guy was shipped back to Pennsylvania (The Meadows), after his Carey victory by trainer Norm Parker but will return for Saturday’s second leg of the Incredible Finale and most likely will be joined by his regular driver Jim Pantaleano. Just one division was needed in the first rounds of both the Beulah and Erwin Dygert trots and they went to Daisy Lou Duke and Trixie’s Jethro respectively. A first or second place finish Sunday by those trotters, would likely nail down a starting berth in their finals, since single round divisions are expected in all of those trotting series legs. Next in line in the Beulah Dygert behind the Steve Searle Stable’s Daisy Lou Duke are Lous Credit Report (25), Fox Valley Elana (12), Beatrice (8) and Lous Game N Match (5). After one round of the Erwin Dygert the John D Finn Stable’s Trixie’s Jethro (5) is followed by Totally Pazzazzed (25), Muscle Image (12), Picky Picky Valor (8) and Cassisandfifth (5). A $200 entry fee is required for both Cardinals and Violets. The Plum Peachy and Carey also carry $200 starting fees. Both of those ICF stakes will offer a second round purse of $12,000. Since there were only five candidates for the five openings on the board, the candidates will be named as directors by acclamation at the annual meeting. The Jim Eaton Stable’s Walter White is expected to be a heavy favorite in Sunday’s $15,000 Open Trot Handicap and justifiably so after a rather effortless triumph a week ago in his Hawthorne debut. The five-year-old gelding was assigned the outside seven-slot in the second race feature but Walter White was allocated the nine-slot last week and that didn’t prove to be much of a deterrent. Driver Kyle Wilfong comfortably got him to the top where he basically went unchallenged. Trainer Jim Eaton doesn’t think his prized trotter will have it so easy this time around. Walter White joined the Eaton Stable in November of 2015 after campaigning out of the barn of Jimmy Takter as a 2 and 3-year-old. The well-bred Cantab Hall trotter made almost $200,000 in his first two seasons for Takter and he did it winning only three races. A $57,000 yearling buy (the next year his brother sold for $165,000 at Harrisburg) Walter White was auctioned off for a $33,000 bid to Eaton for his primary owner Bob Silberberg of Farmington Hills, Michigan. Silberberg got his money back and a lot more when Walter White banked over $67,000 as a 4-year-old racing in Pennsylvania. One of those wins came in a $77,120 division of the International Stallion stake at Lexington, another in a $58,152 PASS stake at The Meadows. 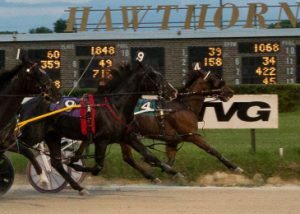 Walter White took a $13,200 non-winner of four event at The Meadows in his initial start for Eaton and three outings later captured a $13,600 non-winner of five trot. The horse went on to win five more races for his new stable. Thus far Walter White’s 5-year-old campaign is going even better. The gelding has added $72,325 on his card in 17 trips postward. 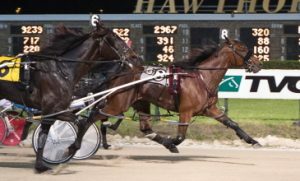 Among his five season victories were a pair of $22,000 Open triumphs at Miami Valley Raceway in Ohio and a $21,000 Invite at Hoosier Park in late April. Lining up in an effort to keep Walter White from revisiting the Hawthorne winner’s circle is Hard To Rock This (Keith Crawford), assigned the one-slot, Topville Avatar (Dale Hiteman), Big Expense (Kyle Husted), Pridecrest (Jared Finn), Fox Valley Veto (Casey Leonard) and Rever Ever (Don Harmon), appointed the six-post after his late closing second place finish in last week’s Open Trot. Peter Karras’ ICF mare Fox Valley Charm was one of three winning drives last night for Mike Oosting. (Four Footed Photo). A Charming Victory: The 5-year-old ICF pacer Fox Valley Charm picked-up her first victory at the meet in Saturday’s eleventh race, a $10,000 conditioned race feature for filly and mare pacers. She was one of three winning drives on the card for Mike Oosting. The 6-5 favorite got command leaving from the seven-post at the first quarter (29 flat) and after another modest panel (29.3) had more than enough left to put away the pocket horse Vintage Babe by one-plus lengths in a 1:54 flat mile. Fox Valley Charm is trained by Rodney Freese and owned by Peter Karras of Sherman, Illinois. Kyle Wilfong had his second consecutive driving double Friday night. One of the young drivers at Hawthorne is Matt Avenatti. The 23-year-old and his younger brother Wyatt are sons of the veteran Illinois horsemen Dave Avenatti who has been a staple on the state’s County Fair Circuit for a number of decades. While the soon-to-be 21-year-old Wyatt is now driving at Bluegrass Downs in Kentucky. 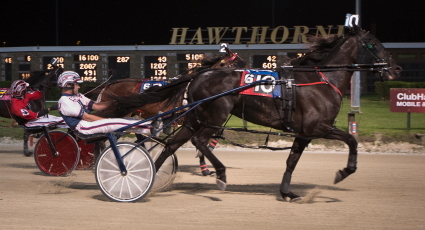 Matt has remained at Hawthorne and as the meet as gone on the number of driving opportunities for him has grown. You might think when your father is a long-time horseman that would have always been the path to take from the time you are a little kid. “I’ve been around horses all of my life but when I was younger I didn’t really think about it to make a living,” said Matt. “I went to college (Wabash, Indiana) and ran track there. It was in college when I thought about it as a career. “I won my first Fair race at Martinsville in 2013 and then later that summer I won my first pari-mutuel drive at Lexington, Kentucky. I thought to myself ‘this is too easy’. Of course, Matt was a naïve 19-year-old at that time. Now he’s a month away from his 24th birthday and has learned, the hard way, success in this business doesn’t come easy. It takes a lot of hard work and even then there are no guarantees of having a fruitful career as a driver and or trainer. This is Matt’s second season at Hawthorne and while things got off a little on the slow side this year for the native Illinoisan, they have picked-up lately. Avenatti had five drives last Sunday, a high number for him on a Hawthorne card, and pulled off a surprise victory in the first race with Eligio Boccia’s Lacarmeliliana, a 10-1 longshot. Matt also had second place finishes Sunday with Fancy Creek Jolene in the fourth and Muscale the ninth. When you’re a young driver or one without years of driving experience you rarely find yourself going postward behind one of the favorites. Most often you’re driving a horse whose trainer would be happy to get any kind of a check in that race. That’s why it wasn’t surprising to sees some of Avenatti’s winners at Hawthorne meet light up the tote board at huge prices. When he won a division of the opening round of the Plum Peachy with the Kim Hamilton Stable’s Fancy Creek Jolene the filly popped at 45-1 odds. Fancy Creek Jolene’s victory came as a shock to most of the Hawthorne bettors but not to Matt. A week later Matt steered the ICF trotter Storm Winds to her maiden win at odds of 30-1 for trainer Ivar Hyngstrom. Last night Matt drove the 22-1 longshot Lumberjack Willie ($46.00) to an upset victory in the ninth race from the 10-hole. He also trains the 10-year-old gelding. The Hawthorne meet is about a third of the way through its 2017 session and Matt is enjoying it and is optimistic it will turn out well for him. Hot Pace: The 6-5 favorite Hot Rod Dylan (Mike Oosting) had to work hard to hold off the late-charging Yankee Bounty (Jared Finn) and nail down his 12th victory of the year in the $12,500 Friday feature Open Pace for 4 and 5-year-old pacing males. An early battle saw Hot Rod Dylan ($4.20) get command from Feelnlikearockstar (Tyler Shehan ) soon after the first quarter pole (27.4) with Evergreen Elite (Ridge Warren) parked from the get-go from the 10-hole right on his tail. It took a quick 26.4 second quarter for Evergreen Elite to take over the lead with Hot Rod Dylan in the pocket however the 54.3 half took its toll on the leader in the lane and Evergreen Elite faded out of contention. A second over trip put Yankee Bounty (10-1) right alongside Hot Rod Dylan at the three -quarters (1:23.1) but the Tom Simmons trainee couldn’t get past and dropped a scant nose decision to the Nelson Willis trained 5-year-old gelding at the end of the 1:51.1 mile. Kelly D (Mike Rogers) at 84-1 was third. Still Perfect: Herman Wheeler’s Major Bliss (Bob Smolin), unraced until this season at the age of six, made it 6-for-6 in his delayed career with another win in the 12th race nightcap. Casey Leonard ended Friday night with three more winners while Mike Oosting, Tyler Shehan and Bob Smolin all had driving doubles. Trainer Britney Dillon had three horses from her barn make a stop in the winner’s circle. This week’s Open Pace for colts and geldings has a little twist to it. Tonight’s $12,500 eighth race is strictly for four and five-year-olds, leaving some of the older elite pacers at the meet back in their stalls. A full 10-horse field will go to the starting gate in the eighth race with the post positions drawn by groups. The first four slots will have Skim The Top (Don Harmon), Dinky Dune (Kyle Husted), Kelly D (Mike Rogers) and Sir Mammo (Jim Lackey). The second grouping (posts 5 through 8) will be manned by Feelnlikearockstar (Tyler Shehan), Yankee Bounty (Jared Finn), Hot Rod Dylan (Mike Oosting) and Coal Hanover (Kyle Husted). Hot Rod Dylan will open as the luke-warm 7-2 first flash favorite after picking up his eleventh victory of the year a week ago in a Hawthorne Open III event with a lifetime best clocking of 1:51.3 for trainer Nelson Willis. 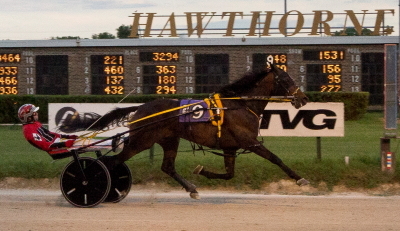 Coal Hanover took an Open II Pace two starts ago in come-from-behind fashion with a season best 1:51.2 mile. Not surprisingly the Ken Rucker Stable’s Evergreen Elite (Ridge Warren) was assigned the outside 10-slot by the Hawthorne Race Office. 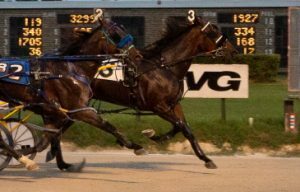 The 5-year-old gelding sped to a 1:48.4 win earlier this month at Hoosier Park, almost a full second faster than his nine Friday rivals have ever paced in their racing careers. Evergreen Elite earlier captured a $15,000 Hawthorne Open and was a close second in two others. Trashytonguetalker (No. 6, Casey Leonard) is shown here in one of his recent Open Pace wins at Hawthorne. (Four Footed Photo). 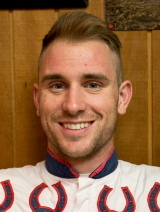 Saddled with the 9-hole tonight is the Terry Leonard Stable’s Trashytonguetalker (Casey Leonard) who came to Hawthorne in May with a little more than $10,000 on his season card and had only one win in 10 tries. The 5-year-old pacer has found Hawthorne to his liking and that’s a bit of an understatement. He’s earned almost $20,000 in his last three starts for trainer Terry Leonard and co-owner Chris Schick of California. After a poor trip contributed to a seventh place finish on May 12th, Trashytonguetalker has come out of it, and rattled off three straight wins, the last pair in $15,000 Open Paces. 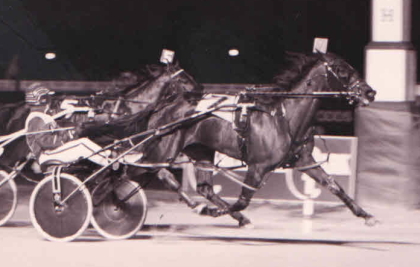 The son of Art’s Chip made almost $30,000 as a 3-year-old with 5 wins and had 6 more when he banked over $42,000 as a 4-year-old while racing primarily at Hoosier. The pacer already has $30,000-plus on this year’s card. What brought Trashytonguetalker to Hawthorne? You would have to agree the move to the Chicago circuit this summer for Trashytonguetalker was spot-on. The pacer’s last three winning final quarters were in 26.4, 26.4 and 27 flat. New Stable: Friday’s first race is for ICF 3-year-old filly pacers and it brought out many of the top distaffers in the division including Plum Peachy first leg winner Filly Forty (Jamaica Patton), last season’s ICF 2-year-old champion Princess Sage (Freddie Patton Jr.) and the Dave Magee Late Closer Series victor Lady’s Party (Casey Leonard). You may have noticed in tonight’s first race past performance lines that Lady’s Party is now being raced out of the barn of Casey’s dad Terry Leonard. This will be Lady’s Party first outing since the Plum Peachy some three weeks ago. The Party At Artsplace filly had to work hard to make the front from the second tier 11-slot and ended up a tiring third. A Five Bagger: Thursday was another big night for Casey at Hawthorne. The meet’s leading driver brought home 5 of the 9 winners on the card and only one was a betting favorite. The Hawthorne Race Office entry box for Thursday’s card was flooded, especially with trainers wanting to get their 2-year-old pacers raced. As it turned out, most of them will. No less than an even half dozen events for freshman will make up the 10 race program. Tonight’s two-year-old contests start with race two and go through race seven with both ICF and open company freshman squaring up. A trio of the paces is for colts and geldings and the other three for fillies. 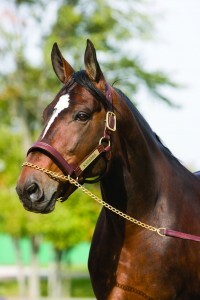 The lion’s share of the ICF juveniles competing tonight went postward in the opening round legs of last Friday or Saturday’s Incredible Tillie (fillies) or Incredible Finale (colts) stake series and are now being pointed to next weekend’s (July 1 and July 2) Cardinal or Violet state-bred stake eliminations. John Barnard’s Heza Real Shooter guns for his second straight win in tonight’s second race. (Four Footed Photo). Heading up the second race is the Bill Crone Stable’s Heza Real Shooter (Bob Smolin) a 1:59.2 winner in his Incredible Finale division last Saturday. He’s Cardinal eligible along with second race starters Sporty Dune, Sagebrush Sharp, Backstreet Lawyer and Fox Valley Gemini. Cardinal eligible pacers from race three Thursday are Beach Shootingstar, Smokin Eyes, Molina and JB’s Enigma. Herman Wheeler’s Molina (Kyle Husted) was a close second in his Incredible Finale race while the Tom Simmons Stable’s Beach Shootingstar made up a ton of ground in the stretch to finish fourth in his division. Six freshmen nominated for the Cardinal—Shooting Straight, Majesticterminator, Ricky The Flash, Not Me Gram, Bootleg Island and Max Hotspur—in race six will have to take on the M T Gunslinger, trained and driven by Charles Arthur, who was a romping seven length winner in his initial start and is listed at low-end 4-5 odds in the morning line. The eight-horse fourth race for first season fillies, has seven Violet hopefuls in it: Breathtaking Sky, Shooting Cool, Over Speeding, Yank’s Rendezvous, Fancy Creek Annie , Shelly On My Mind and Darlin Dune. No. 1 Allbeastnobeauty wasn’t nominated for the Violet. Four more fillies in race five are Violet candidates: Jazzy Bern, Lotus Gram, JB’s Shooting Star and Poppy Seed. Those four along with Call Sign Charlie, Rippin An Runnin and Poppy Seed will challenge Dee Rocks (Tim Curtin) from the barn of Springfield based trainer Dossie Minor. On June 15 Dee Rocks, a Rockin Image filly, led from start to finish in her winning in 1:57.2 and most impressively paced a sizzling 25.4 last panel. For more Violet aspirants, The Sis Master, Among The Elite, Fox Valley Miranda and Watch Me Nae Nae, are among the eight fillies in race seven. The first-time starters Among The Elite (Ridge Warren) and Fox Valley Miranda (Matt Avenatti) are half-sisters to some fast former Illinois bred champions. The Nick Prather Stable’s Among The Elite is out of the Broadway Express broodmare Broadway Elite who gave us sub 1:50 pacers Enemy At The Gate (1:49.2, $451,782) and Let’s Get Started (1:49.4, $532,230). Fox Valley Miranda is trained by Martin Woodward for Fox Valley Standardbreds and had a 1:58 flat winning qualifier a week ago at Hawthorne with Matt Avenatti at her lines. “Miranda” is a daughter of Yankee Skyscaper out of the Sportsmaster dam Slammin Annie and six of her foals took lifetime marks under 1:55 with the fastest by 2008 Woodrow Wilson champion Fox Valley Barzgar, a 1:50.2 mile in that prestigious $370,414 Meadowlands freshman stake. The seventh race early favorite is the Herman Wheeler Stable’s Sheincrediblenasty (Kyle Husted) second best in her division of the Incredible Tillie stake series last Friday. 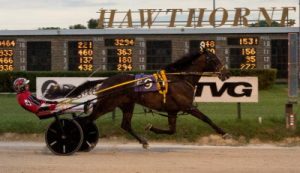 Its front and center time for this season’s crop of ICF 2-year-old trotters when the first round legs of the Fox Valley Flan and Kadabra stake series go to the starting gate Sunday evening at Hawthorne. First up is the $12,000 Fox Valley Flan opening round with a jam-packed field of 11 first season fillies battling it out in the third race. With the entire field making their pari-mutuel debuts and No. 11 Frontier Jackie (Richard S Finn) starting in the second tier with 10 gals strung across in front of her, it’s anyone’s guess who will come out on top. Some of the juvenile Fox Valley Flan gals have had brothers or sisters with past success in Illinois trotting stakes. The John D Finn Stable’s Sunny Sasha (pp 8, Jared Finn) is the baby sister to former state-bred stake champions Captain Greedy (1:55.4) and Trixie’s Jethro (1:57.4) while the Mike Roger Stable’s Undeniable Emotion (pp 4, Ridge Warren) is the younger sister of Totally Pazzazzed. The free legged trotter Fox Valley Persia (pp 9, Kyle Husted) is a full sister to Fox Valley Qatar (1:56) a multi-stakes champion a few years ago for the same Herman Wheeler Stable. The competitive third race Fox Valley Flan field also lured Good Design (Kyle Wilfong), E L Miss Kaibra (Mike Oosting), Lous Silver Star (Jamaica Patton), Powerful Temtrist (Gary Rath), Fancy Ferge (Freddie Patton Jr.), Fox Valley Sunrise (Dale Hiteman) and Fox Valley Winnie (Casey Leonard). Two races later a full field of 10 ICF trotting colt and geldings all make their first pari-mutuel starts in the initial round of the Kadabra stake series. One of the likely favorites is Dr. Patrick Graham’s True Detective (pp 8, Casey Leonard) from the barn of trainer Curt Grummel. The Lou’s Legacy colt won his Springfield qualifier in 2:03 flat. His dam Maple Grove Glide gave us the 2011 Super Night champion Maple Grove Shaelyn (1:54.4) and the productive trotting mare Powerful Princess (1:58.2). True Detective’s stable-mate Big Lou (pp 6) is another Lou’s Legacy colt. He is the third foal of Fox Valley Luxury who captured Balmoral’s $100,000 Lady Lincoln Land and the $50,000 Fox Valley Flan, as well as the $50,000 Springfield Championship in 2011. True Detective and Big Lou will race uncoupled when they take on Majistic Caprice (Paul Cavett), Fox Valley Strpwr (Cornelius Cavett), Cruzen Cassi (Jared Finn), Loustat (Jamaica Patton), Krispy K (Ridge Warren), Freddie Da Fox (Freddie Patton Jr.), Legal Entry (Kyle Husted) and Two News (Mike Rogers). 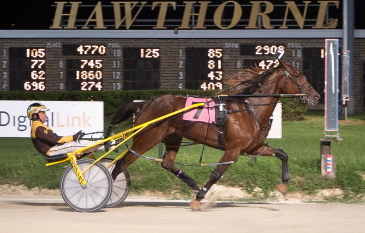 Sharing the Sunday spotlight at Hawthorne is the $15,000 Open Trot, drawn by groups (1-4) (5-8) and (9). It’ll go as the second race. Not surprisingly the Jim Eaton’s stable Walter White was assigned the outside nine-slot by the Hawthorne Race Office. The 5-year-old gelding is having a strong year for owner Bob Silberberg who acquired the one-time Jimmy Takter trained trotter near the end of 2015. Walter White banked $67,257 last year for Silberberg and already has almost $65,000 on his card for 2017. Two of the trotter’s four season victories came in $22,000 Open Trots at Ohio’s Miami Valley Raceway and another in a $21,000 Hoosier Park Invite in late April. Walter White has no easy task tonight leaving from the nine-slot with a nice field of trotters inside of him. The first four slots will be manned by Nashville Holiday (Mike Oosting), Rever Ever (Don Harmon), Big Expense (Kyle Husted) and I Could Care Less (Keith Crawford), gunning for his fourth in a row at Hawthorne. Posts five through eight belong to Charles VII (Bob Smolin), Pridecrest (Jared Finn), Topville Avatar (Dale Hiteman), a two-time Open Trot winner at the meet, and Fox Valley Veto (Casey Leonard) who proved best in last Sunday’s $15,000 Open. Sounds Greek To Me: Tripoli Stable’s Mykonos ($7.80), nicely handled by Casey Leonard, shot up the inside to nail down a victory in his debut with a neck decision in the first $12,000 division of the Incredible Finale stake series for ICF 2-year-old pacing colts and geldings. Not Me Gram (pp 1, Ridge Warren), Mykonos (pp4) and Shooting Straight (pp9, Bob Smolin) all went out and battled for the lead. On the backside it was Shooting Straight on top, with Mykonos in the pocket and Not Me Gram a close-up third. Shooting Straight was backed down and took the field to a 1:01 first half, bunching up the nine-horse field and when Not Be Gram powered out of third in the turn Mykonos and Leonard suddenly lacked racing room as they came down the lane. It was Mykonos (No. 4) over Shooting Straight (No. 9) and Not Me Gram (No. 1) in Saturday’s first Incredible Finale ICF freshman colt division. (Four Footed Photo). Casey found it when he took the Tom Simmons trained freshman to the inside lane, squeezed through a narrow opening, and the homebred son of Corner Blitz did the rest, going on for 1:59 victory for his Norridge, Illinois owner. Not Me Gram was third, beaten a half-length while the 4-5 favorite Beach Shootingstar another Simmons trained freshman, made up six-plus lengths in the lane to be fourth, less than two lengths off the winner. Casey was back in the winner’s circle after the second Incredible Finale division was over, this time with John Barnard’s Heza Real Shooter $13.00). Despite a tough trip Heza Real Shooter worn down the pacesetting 3-5 favorite Molina (Kyle Husted) in the stretch and posted a half-length victory with a 1:59.2 mile raced on a “good” racing surface. Big Boy Frazier (Tyler Shehan) was third behind the winning Bill Crone trained 2-year-old. OK Heavenly ($2.80) stayed perfect in the meet’s filly and mare Open Pace by taking the $15,000 co-feature in 1:52.3 with Leonard again at her lines. The Angie Coleman trainee is 4-for-4 at Hawthorne this year. Hipnumberone (Mike Oosting) had a big effort to be second best, three-quarters of a length behind the 5-year-old mare owned by Illinoisans Dandy Farms and Mark Winship. Casey Leonard ended Saturday evening with six winning drives. Juan Franco has a driving double. When the bugle call sounds off for Saturday night’s Hawthorne opener you’ll get a look at a field of nine 2-year-old pacers in the post parade all aspiring to make that first major step to the Incredible Finale Championship later in the season. A $12,000 purse will be on the line in the first division’s opening round of the Incredible Finale stake series for ICF 2-year-old pacing colts and geldings with a scheduled 7:10 pm post time. You’ll have to stick around another couple of hours to watch the second division of 10 state-bred youngsters slug it out because that split is slated as the seventh race with a 9:10 pm or thereabouts post. With 6 of the 9 first divisions starters making their pari-mutuel debut tonight and all but John Barnard’s Heza Real Shooter doing the same in the second split, there is obviously a lot of uncertainty as to which freshmen will get bet down and which won’t. Also, just how will these “green” colt and gelding pacers react to the sound of racing fans on the apron, the water truck, the track’s grader, and perhaps some other possible first-time distractions. Tonight’s Incredible Finale honors one of the all-time great ICF pacers. The Tom Harmer trainee was the state’s first horse to earn $1 million. He’s shown here winning at old Sportsman’s Park in 1985. Incredible Finale went on to also be an outstanding Illinois sire . (Pete Luongo Photo). One of the second division pre-race favorites Ricky The Flash, driven by his trainer Freddie Patton Jr., does have the advantage of a winning start on the Martinsville Fair Track. Note that his time of 2:02 flat was on a half-mile track termed “good” four days ago. Molina (Kyle Husted), the outside 10-horse in the second division got my attention despite his obvious bad post. The Sagebrush colt drew off in his 1:58 Hawthorne qualifier, finishing six-plus lengths ahead of Heza Real Shooter in it. Molina hails from the Herman Wheeler Stable and the barn is off to an excellent start at the meeting, hitting at a 25 per cent winning clip (7 for 28) heading into this week. The other second division Incredible Finale candidates are Sheriff Coffey (Kyle Wilfong), JB’s Enigma (Bob Smolin), Max Hotspur (Juan Franco), Big Boy Frazier (Cornelius Cavett), Talk About It (Tim Curtin), and Backstreet Lawyer (Mike Oosting). The fastest winning qualifier among the first division starts belongs to the Tom Simmons Stable’s Beach Shootingstar (Mike Oosting) with his 1:57.2 mile at Springfield nine days ago. A solid second to Beach Shootingstar in that June 15 qualifier was Tripoli Stable’s Mykonos (pp 4, Casey Leonard), the younger brother of Zone Blitz, another Tom Simmons trainee. Mykonos was named after the Greek island, a popular vacation spot in the Aegean Sea. Another first split freshman who won his qualifier is Dandy’s Phoenix (pp 2, Kyle Husted). Don’t be deceived by that colt’s slower 2:00 time. The No. 3 horse Sagebrush Sharp (Jamaica Patton) cut modest fractions of 30.4, 30.3 and 30 flat before giving way to Dandy’s Phoenix in the late going. The Rob Rittof trained Dandy’s Phoenix is a Sportsmaster colt out of the broodmare C Suzabelle, making him a full brother to Dandy’s Diva and her first foal, Kelly’s Keepsake, (1:51.1, $587.391), the 2007 Filly Orange and Blue and American National Filly Pace champion at Balmoral for trainer Erv Miller. Also looking to come away with the winner’s share of the $12,000 first division pot is Not Me Gram (Ridge Warren), Sagebrush Jim (Matt Avenatti) Safari Sage (Kyle Wilfong), Smokin Eyes (Gary Rath), and Shooting Straight (Bob Smolin). The last three youngsters each have a pari-mutuel start at Hawthorne on their résumé. The Hosea Williams trained Rollin Coal (Casey Leonard) captured last night’s first division of Hawthorne’s Incredible Tillie stake series. (Four Footed Photo). Tillie Tales: Rollin Coal (Casey Leonard) and Fox Valley Jazzy (Tyler Shehan) each took a major step towards Hawthorne’s Night of Champions with opening round victories in their respective $12,000 divisions of the Incredible Tillie Stake Series for ICF freshman pacing fillies. Rollin Coal ($8.40) spent the middle quarters of her race in the pocket behind the 2-1 favorite Sheincrediblenasty (Kyle Husted). 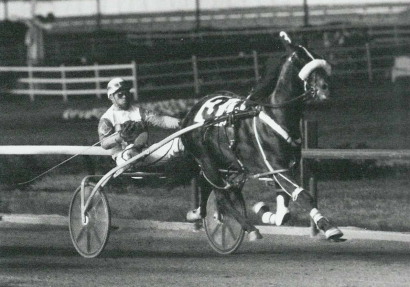 When Leonard pulled her coming out of the last turn the Sportsmaster filly responded, coming on strong to post a one and one-quarter length victory in 1:57.2 in her pari-mutuel debut for her Chicago owner and trainer Hosea Williams. The Herman Wheeler Stable’s Fox Valley Jazzy was hammered down to 1 to 9 odds in her Incredible Tillie split. Shelby Rae (pp 1, Gary Rath) made the winning Yankee Skyscaper filly work a bit to get to the front right before the first quarter (31.1) and then settled in behind her for a two-hole trip. Fox Valley Jazzy went to the half and the three-quarter poles in moderate times of 1:01.3 and 1:30.2 with Shelby Rae looming dangerously right behind her. The two fillies then dueled down the lane with Fox Valley Jazzy ($2.10) digging in when it counted to gain a half-length triumph in 1:57.4. Hot Rod Dylan ($4.80) was given a great trip by his driver Mike Oosting and took advantage of it by taking the $15,000 Open Pace Handicap in 1:51.3. It was the Nelson Willis trained gelding’s fourth win at Hawthorne in five starts for Barrington Hills, Illinois owner Shirley Le Vin. Rocken Camnation (Kyle Wilfong) rallied from sixth , some eight lengths off at the three-quarter pole, to be second with a quick 26.3 last panel, beaten by three-parts of a length. Mike Oosting drove five winning horses on the Friday card. The $125,000 (est.) Incredible Tillie Final is a long way off, but an important first step to gain a starting berth in that lucrative ICF 2-year-old filly pace on Hawthorne’s Night of Champions, will take place this Friday night. Two $12,000 opening round divisions of the Incredible Tillie stake series are on tap. With 13 state-bred filly pacers entered, the first legs were split into two divisions, that were not only different in numbers but also in familiarity as far as going to the starting gate. Of the six freshman fillies in the second race, only the Dennis Brightwell Stable’s Poppy Seed (Mike Oosting) has a start under her belt and that was a fourth place finish eight nights ago. Making their pari-mutuel debuts are (from the two slot out) Fox Valley Euforic (Jerome Daniels), Rollin Coal (Casey Leonard), Sheincrediblenasty (Kyle Husted), The Sis Master (Kyle Wilfong) and Shooting Cool (Bob Smolin). On the other hand 5 of the 7 freshman in the second Incredible Tillie division have a pari-mutuel start. The two exceptions are the Tom Graham Jr. Stable’s Lotus Gram (Casey Leonard) and the Hosea Williams Stable’s Jazzy Bern (Brian Carpenter). 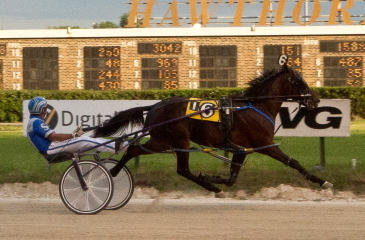 Herman Wheeler’s Fox Valley Jazzy (Tyler Shehan) is tonight’s Incredible Tillie Second Division favorite. (Four Footed Photo). The first three finishers in last week’s initial 2-year-old filly pace at the meet—Fox Valley Jazzy (Tyler Shehan), Shelby Rae (Gary Rath) and The New Americana (Steve Searle)—will make their second career starts along with JB’s Shooting Star (Bob Smolin) and St. Elmo Sage (Kelcey Perymond), the fifth and seven place finishers. Fox Valley Jazzy looked very good in her winning debut for trainer Herman Wheeler, brushing to the top before the half (59.4) with Tyler Shehan and then drawing off by almost four lengths in a snappy 1:55 flat (27 flat last panel) for her Crystal Springs, Mississippi owner Demarrio Brown. Shehan liked what he saw from Fox Valley Jazzy who romped in the slop a week earlier in her qualifier (2:01.3) with a 27.2 last quarter. Incredible Tillie (Andy Miller) is shown here winning the Filly Orange and Blue Final on Super Night 1999 at Balmoral Park. (REB Photo). The Incredible Tillie stake series honors the Erv Miller trained ICF pacer who sparkled at the turn of this century. The daughter of Incredible Finale, out of the Ideal Society broodmare Kelly Guru, was a perfect 12-for-12 in her freshman season in 1999. She swept the key ICF championships at Springfield, Du Quoin and the Filly Orange and Blue on Super Night and with her share of the $1 million bonus then being offered by the Illinois Department of Agriculture her first season earnings soared from $212,580 in purse money to $512,024. Incredible Tillie took her lifetime mark of 1:49.2 in 2000 as a 3-year-old, winning 9 of 18 starts and banking another $218,988. Health issues curtailed her racing career as a 5-year-old after only five starts. She ended up with a sparkling lifetime record of 30 victories in 57 outings and amassed $916,024 on her card. Three Bagger: Casey Leonard had a driving triple Thursday night and it came in consecutive races, the fourth with Zone Blitz, the fifth with Rockin Praline and the sixth with JD Jay Dee. Tim Curtin had a pair of winners, bringing home the 2-year-old Dee Rocks in race two and with the 4-year-old ICF pacer Caffeine Kid in race eight.